← The Cineworld Challenge is set! Before the turn of the century, Bobby and Peter Farrelly had it all. They had laid out a comedy-stall for all to admire with the likes of “Dumb and Dumber” and “There’s Something About Mary”. Both iconic movies which relied on the gross-out factor and true belly-laughs to draw in audiences the world over. Their unique take on buddy movies and romantic stories were loved and all hailed the dawn of a new kind of film-funny for the future. Come to this side of the Millenium and with hits such as “Me, Myself & Irene” and the fattist “Shallow Hal”, and the Farrelly Brothers really could do no wrong…and then it all kinda dried up. “Stuck On You” failed to recoup it’s budget and “The Heartbreak Kid” starring Ben Stiller did well, even though it was only Farrelly-Directed and not written. 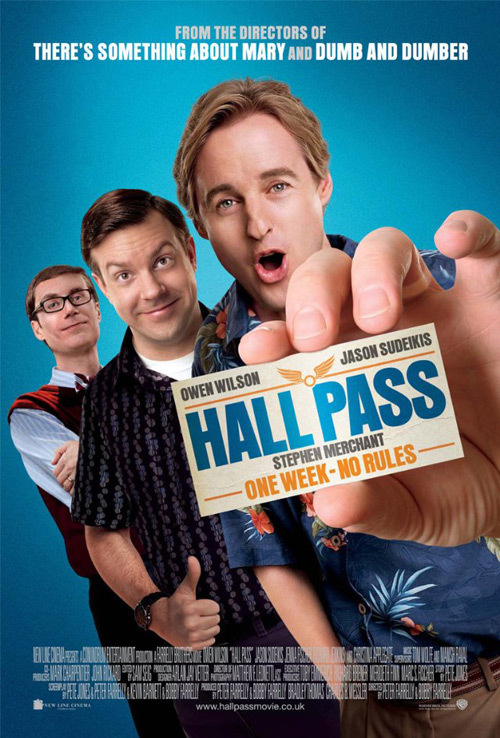 So it was with mixed feelings that I approached Hall Pass, the new offering from the one-time comedy-kings. The synopsis is simple yet silly. Two guys, stuck in sexless marriages which don’t look to have the light-at-the-end-of-the-tunnel about them anymore, are given a “Hall Pass”. A one-week granting of freedom by their respective wives to run free and wild and lap at the pool of enchantment once more. The idea is quirky. Will the middle-aged men relive their youths and recapture their forms and bask in their own glory? Or will they crash and burn? Egged on by their peers (of which Steven Merchant forms part of the group), they embark upon the clichéd ‘Voyage of Self-Discovery’ and through drinking, drug-taking and cavorting, naturally land themselves in a heap of mess. Meanwhile, the wives are left at home to look after the kids and ponder over what their other halves may or may not be getting up to. The film unfortunately fails to kick into gear as much as I would expect from the Farrelly’s early work. We know they can pull off gross-out, but even the scenes which are meant to shock and leave us open-mouthed just don’t quite work. One is just grotesque and another in the bathroom is really quite vile and not very funny at all. Owen Wilson does suffer once again by being the lead character. For me he works much better in a supporting role such as he gives in “Night At The Museum” or even “Armageddon” and sometimes you just can’t tear yourself away from looking at the extremeness of his crooked nose more than delving deep into his character. Jason Sudeikis does well as the backup to Wilson in a role that fits him quite well. He’s gross, unlucky in everything he does and very crude which suits the character perfectly. But I think the biggest props should go to Jenna Fischer and Christina Applegate in the roles of the long-suffering wives. They both put in great, believable performances and were a joy to watch, much more so than their un-funny male counterparts. What the movie adds up to is a sentimental flick which not too many true laughs through very forced set pieces that seem to try too hard and suffer as a consequence. All in all, the Farrellys have not scored the winning goal with this movie, but it could be used as a stepping stone to nailing their Big-Screen Three Stooges remake which is due out in 2012. This entry was posted in Movies and tagged cinema, Cineworld, Hall Pass. Bookmark the permalink.